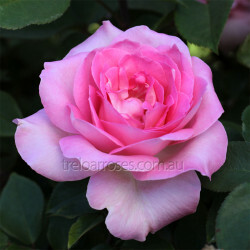 Hybrid Tea roses have been the most recognisable class of rose for over a hundred years. They bare classic full flowers either singly or several to a stem. Many have a good fragrance and are excellent for cut flowers. Height ranges from 1m to 2m but averages 1.5m tall. (Mactaurang) - The striking yellow blooms are striped with orange, bright in the new flower, softeni..
(Korsamasi) - A lovely deep pink hybrid tea rose with a delightful fragrance. Glowing cherry red bud..
(Kordes) - Very large exhibition style flowers, on long strong stems. The Old Gold coloured blooms, ..
(Korschaparat) - Very attractive colouring of coppery gold. Worth a place in the garden for colour a..
(Tananilov) - Large, very fragrant blooms of shell pink with a deeper margin on the petal edges, pro.. The colour is clear deep mauve of a most attractive shade, and the form is particularly good with a ..
(Fryxotic) - Large flowers in glowing colours range from creamy apricot to warm amber pink. Sweet fr..
(Korsteflali) - The large, clear silver pink blooms have classic form, are high centred with a petal..
(Korbatam) - Classic shaped blooms of light yellow and the ability to flower deep into winter gave t..